I am a self-taught painter and work with acrylics. I began to paint seriously around 2010 and aspire to continuously develop and improve. 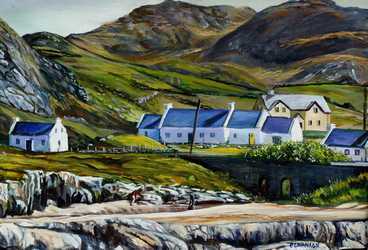 I have depicted images of my local Irish landscapes, seascapes and street scenes and also enjoy the challenge of portraiture. As well as originals, I am offering open and limited edition giclee prints of my artwork - details of pricing etc is contained within the individual profiles for each piece. Please feel free to contact me if you want any further information or if you wish to commission a portrait. Portraits can be produced from your photos so if you wish to consider a painting as a unique gift for someone or to perhaps have an older b & w photograph transformed into a vibrant colourful painting, I am sure that I can satisfy your requirements.